Nearly 1,100 men and women from the design, construction, and real estate community gathered at the New York Building Congress Leadership Awards Luncheon to pay tribute to industry leaders, including Howard P. Milstein, who received the 94th Anniversary Leadership Award. The event took place on May 13, 2015. 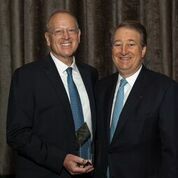 Howard Hughes Corporation CEO David Weinreb was joined by Douglaston Development Chairman Jeffrey Levine in presenting the 94th Anniversary Leadership Award to Mr. Milstein, who recently concluded a four-year tenure as chairman of the New York State Thruway Authority. New York City Deputy Mayor for Housing and Economic Development Alicia Glen and Skanska USA President and CEO Richard Cavallaro were also honored at the luncheon, which was co-chaired by David Weinreb and WSP│Parsons Brinckerhoff President and CEO, U.S., Gregory Kelly. Howard Milstein receives the New York Building Congress Leadership Award. He is introduced by Jeffrey E. Levine.